Maxime Donze, coach of the Swiss Women Team. Maxime started playing Tchoukball when he was 13, in la Chaux-de-Fonds Switzerland. At 16 he became the coach of the club with two others friends, because the former trainers resigned. Therefore he and his two friends took the lead to keep the club alive. Between 1996 and 2003 he played at the International level, with the Swiss National Team. In 2004, he and Michel Thomann became coaches of the Swiss Men team which finished first at the WTC 2004 in Taiwan. 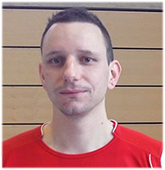 Since 2005 he has been the Swiss Women Team coach, and following his passion of coaching, he created the blog, Tchouk file.